Security panel gates have round or square steel tubular frames that are plain steel, galvanized, primed and painted or powdercoated. 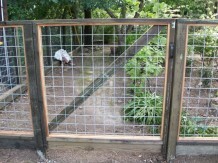 The mesh is a welded 6 guage galvanized panel that is welded to the tubular frames. The typical grids we have available are security panel (2″ x 4″), combo panel (graduates from 6″ x 4″ to “6” x 2 1/2″) and hi-five panels (4″ x 4″). Steel security walk gates are simple but durable and useful utility gates for commercial, residential and country property applications. 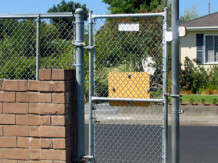 Chainlink gates are made from round or square steel tubular frames that are plain steel, galvanized, primed and painted or powdercoated. The chainlink mesh is available in many guages or opening sizes. 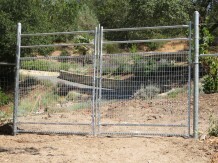 The chainlink comes plain galvanized or vinyl-coated and can also have vinyl slats for additional privacy. Chainlink walk gates are useful for more than chainlink fences. 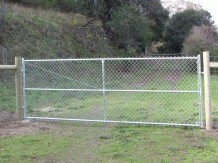 They can also be installed with other types of fencing such as kennels, enclosures, corrals or deer fences. The gates are made from round or square steel tubular frames that are plain steel, galvanized, primed and painted or polycoated. The chainlink mesh is available in many guages or opening sizes and comes plain galvanized, vinyl-coated and or can have vinyl slats for additional privacy.